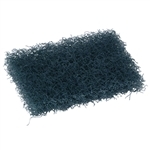 Ease the burden of washing dishes with our heavy duty scrubbing pads and scouring pads. They last for weeks in your restaurant kitchen and get grease and grime off of your pots and pans with ease. Glit Disco Pot and Pan Scrubber Blue - 3.5 in. x 5 in. Glit Disco Heavy Duty Pot and Pan Scrubber Blue - 3.5 in. x 5 in. Glit Disco Stainless Steel Sponge Silver Scrubbers - 1.75 Oz. 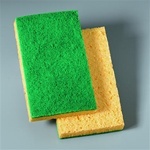 Glit Disco Medium Duty Sponge and Scrubber Green - 5.8 in. x 6.25 in. Pot and Pan Scrubber Heavy Duty Nylon Blue - 3.5 in. x 5 in. Wholesale commercial Dishwashing Scrubbers make cleaning your restaurant dishes a breeze in any restaurant or cafeteria kitchen.